Pinku Mukherjee, Ph.D., received the honor for her innovative research and development of cancer diagnostics and treatments. This honor strengthens my resolve to continue working toward the discovery of solutions that improve the quality and efficacy of care for cancer patients. 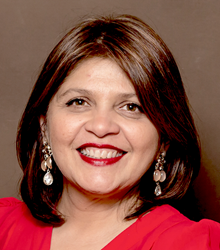 OncoTAb, Inc., a University of North Carolina at Charlotte (UNC Charlotte) spin-out company, announced that Pinku Mukherjee, Ph.D. has received the O. Max Gardner Award, the UNC Board of Governors’ highest faculty honor. Mukherjee received the award, which recognizes faculty contributions to humanity’s welfare, for her innovative research and development of cancer diagnostics and treatments. Mukherjee currently serves as the Irwin Belk Endowed Professor for Cancer Research at UNC Charlotte’s Department of Biological Sciences. Prior to founding OncoTAb, she spent more than 10 years working at the Mayo Clinic. During her 27 years of cancer research, Mukherjee has contributed to more than 100 peer-reviewed journals and proceedings. She is the sole inventor of the OncoTAb antibody, which has led to the development of early-detection blood tests for breast cancer. Mukherjee serves on scientific review panels of the National Institute of Health, Department of Defense, Susan G. Komen Breast Cancer Foundation and American Association of Cancer Research. She received her M.S. and Ph.D. in Immunology from University of London. This press release is neither an offer to sell nor the solicitation of an offer to buy shares or any other security in any jurisdiction. OncoTAb (http://www.oncotab.com) is a University of North Carolina at Charlotte (UNC Charlotte) spin-out that has licensed a patent-protected technology from the university. Its applications span the life cycle of cancer patients, from detecting and locating cancer to treatment and monitoring for recurrence. The company is gearing up for a pivotal clinical study of its blood test and is pursuing additional diagnostic, imaging, and therapeutic product development and commercialization in the cancer space.